Welcome readers to a new blog hop I am participating in for the first time this month! 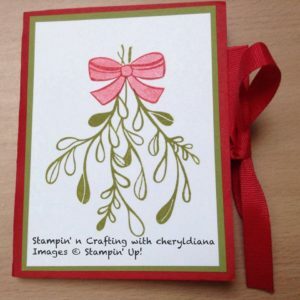 I’m excited to join the Stampin’ Friends Blog Hop and see all their beautiful projects! Most of us are now thinking of Christmas and what to make or buy for our family and friends. For my projects this month, I wanted to use one of the Suites from our Annual Catalogue as we sometimes miss these when the Autumn/Winter catalogue comes out. My chosen suite this month is Under the Mistletoe which consists of the Mistletoe Seasons stamp set, Under the Mistletoe designer series paper and of course matching card stock and embellishments including ribbon. My first project is a mini album. Whilst I was attending a summer scrapbook crop I was taught how to make a mini album using a sheet of 12×12 DSP. As I wanted samples for a Christmas Craft Fayre I decided to make mine using Christmas DSP. 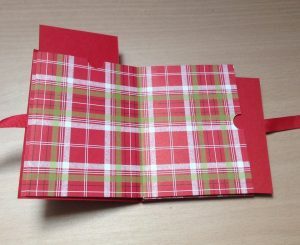 I have used Real Red card stock to make pull out journalling cards so that the pages that are seen can hold more photos. For the album cover I used Read Red card stock and fixed the ribbon between the DSP and the cover to make it stronger and of course hide where it was stuck. Then I cut Old Olive card stock to break up the Real Red cover. 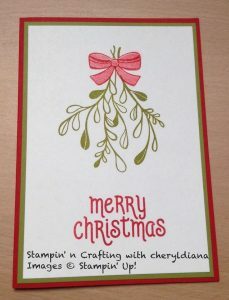 On the front cover I also cut a piece of Whisper White card stock and using our lovely Stamparatus stamped the mistletoe and bow. I love how the Stamparatus ensures that you can line everything up and mass produce images. Once everything was stuck I decided that it needed a bot of sparkle so I brushed Wink of Stella over the bow to make it shimmer. My second project is a Christmas card. Again using the same colours as above I mat and layered the Old Olive card stock onto the Real Red card base. As I was already using the Stamparatus I added the sentiment to the last plate and stamped it beneath the mistletoe. Love your mini-album. And the card is really perfect to go with it. Welcome to the blog hop glad you have joined us. I love the mini album, very nice!